Uncategorized – What is Nanomedicine? ∑Materials which have at least one dimension less than 100nm are classified as nanomaterials. These materials can be may shapes and sizes like spheres, rods, wires, cubes, plates, stars, cages, pyramids among some funny named shapes like nanohedgehogs, nanocandles and nanocakes! 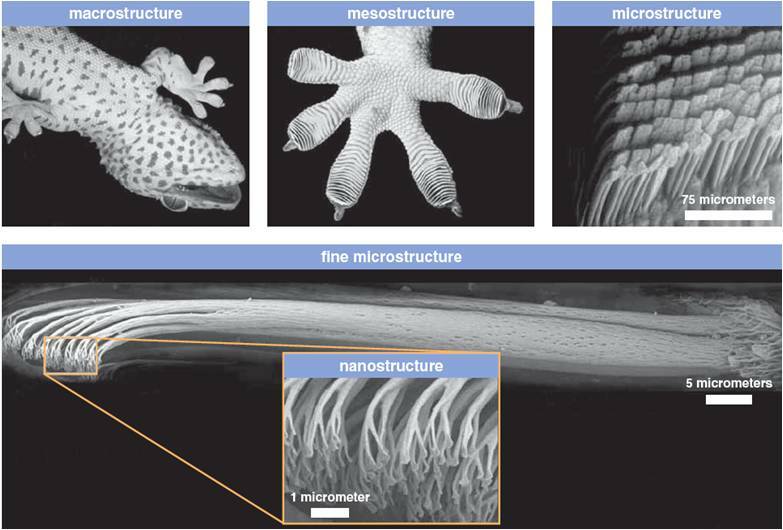 See the paper Morphology-Controlled Growth of ZnO Nanostructures Using Microwave Irradiation: from Basic to Complex Structures for some really inventive names for various shaped nanomaterials! Aside – scientists are pretty terrible at naming things, for example, the “creative” names given to optical telescopes – the Extremely Large Telescope , Large Binocular Telescope, Overwhelmingly Large Telescope, Very Large Optical Telescope. 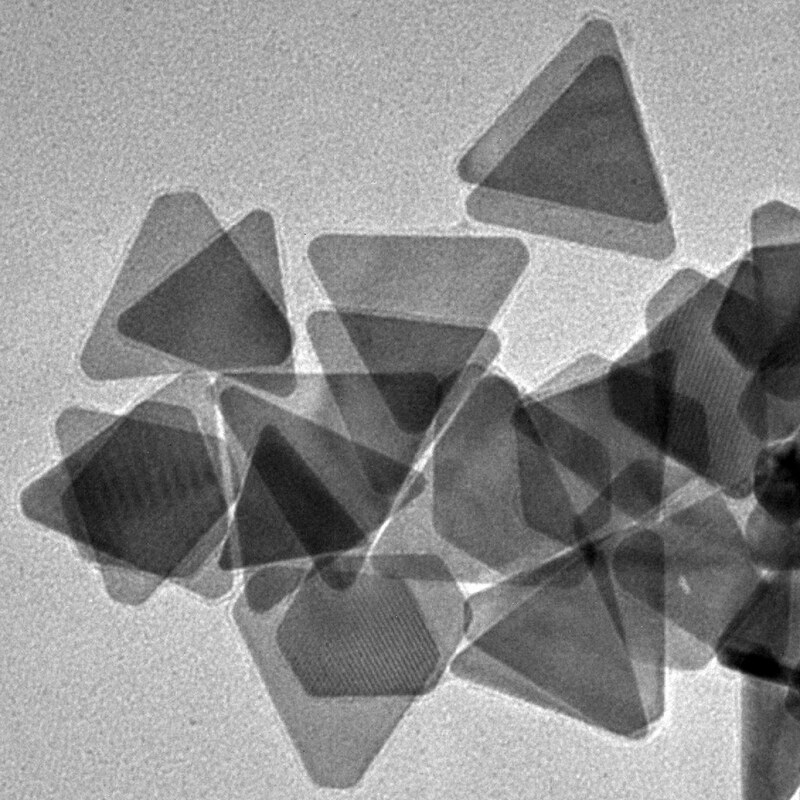 These nanoparticle shapes come in different sizes and different materials too. Broadly we can categorize nanomaterials into two groups – organic or inorganic (but it is possible to have a hybrid inorganic-organic nanoparticle too). Organic nanoparticles aren’t nanoparticles from your local farmers market – they are nanoparticles which contain carbon (and often hydrogen too which forms hydrocarbons) whereas most inorganic nanoparticles don’t contain carbon atoms. Organic nanomaterials include carbon (except fullerenes) , polymeric and lipid-based nanocarriers. Inorganic nanoparticles include metallic/plasmonic, magnetic, upconversion, semiconductor and silica based nanoparticles. The main groups of organic nanocarriers are liposomes, micelles, protein/peptide based and dendrimers. Protein/peptide based nanocarriers are amorphous (non-crystalline) materials generally conjugated to the therapeutic agent and is often further functionalised with other molecules. Micelles and liposomes are formed by amphiphilic (both hydrophilic and hydrophobic parts), micelles form monolayers whereas liposomes form bilayers. Lastly, dendrimer nanocarriers are tree-like structures which have a starting atom core (eg. nitrogen) and other elements are added through a series of chemical reactions resulting in a spherical branching structure. This final structure is not unlike blood hemoglobin and albumin macromolecules. These vesicular nanocarriers can be used to trap both hydrophobic and hydrophilic drugs and even small nanoparticles inside the aqueous/lipid core. This provides protection for drugs and facilitates significant drug loading – minimising toxicity and increasing blood circulation time (increasing possibility that the drug will reach the therapeutic target from avoiding opsonisation). 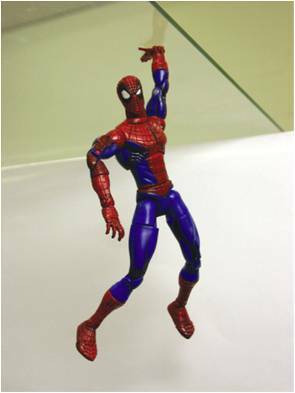 inorganic nanomaterials are stable, robust, resistant, highly functional. and are quite easily cleared from the body. Furthermore, inorganic material exhibit truly exciting mechanical, optical, physical and electrical phenomena at the nanoscale which can be tailored through changes in material, phase, shape, size and surface characteristics. Oftentimes, it is necessary to add a biocompatible surface to inorganic nanoparticles to avoid toxicity, especially for heavy metals. Quantum dots are the most well-known semiconductor nanoemitter. These are typically very small in size ~5nm, which is smaller or equal to the exciton Bohr radius giving quantum confinement. Electrons are subatomic particles with a negative elementary electric charge, electron holes is an empty position in an atom or lattice that an electron could occupy. An exciton is a bound state where an electron and electron hole are electrostatically attracted to each other through Coulombic forces. An exciton bohr radius is the separation distance between the hole and electron. Due to 3 dimensional confinement effects, quantised energy levels are produced in the filled low energy valence band and in the empty conduction band of the quantum dots which is very unlike bulk semiconductors. The energy gap between the conduction and valance band varies with the size of the quantum dot which explains the tunable emissions (colour) when excited. Additionally, alloyed quantum dots can be further tuned because the bandgap is approximately equal to the weighted average of the composite semiconductor material. Quantum dots excited in the near-infrared are expected to be revolutionary in biomedical imaging. There has been concerns about the stability and toxicity, as many quantum dots lose luminescence intensity when exposed to light/air/oxygen/water and they are generally composed of heavy metal materials. Upconversion nanomaterials consist of two parts, first – the host dielectric lattice (e.g., NaYF4) with one or more guest trivalent lanthanide (atomic numbers 57–71) ions (e.g., Er3+, Yb3+). Upconversion is an anti-stokes process, two or more lower energy photons are absorbed (either simultaneously or stepwise) via long-lived real electronic states of the lanthanide dopant and a higher energy photon is emitted. The lanthanide element has a specific electronic configuration with energy levels which is usually independent of the host material type, the nanoparticle shape and its size. Electrons are arranged in shells around an atom’s nucleus, where the closest electrons to the nucleus have the lowest energy. Each shell can hold a certain number of electrons (principal quantum number) – the first shell (1) can hold 2 electrons, the second (2) 8 and the third (3) 18. Within these shells are subshells (defined by the azimuthal quantum number) and are labelled s,p,d or f which can hold 2,6,10 or 14 electrons respectively. In the case of upconversion, the 5s and 5p shells are full whereas the 4f-4f shells are not. But, because 5s and 5p are full – they shield the 4f-4f shells which allows sharp line-like luminescence, i.e. the luminescence peak is not broad. This luminescence is also resistant to photobleaching, high photostability and are nonblinking, which of course is beneficial over fluorescent molecules which experience high levels of degradation. Through careful design, upconversion nanomaterials can display a variety of emission and excitation wavelengths from UV to NIR. At the nanoscale, certain magnetic materials below a specific size exhibit a special form of magnetism called superparamagnetism. Superparamagnetic nanoparticles behave as single domain paramagnets when under an external magnetic field but once the field is removed – there is no residual magnetisation. Typically, these materials are Iron oxide nanoparticles. Additionally, these nanomaterials tend to be non-toxic and can be readily coated with molecules for further functionalization. 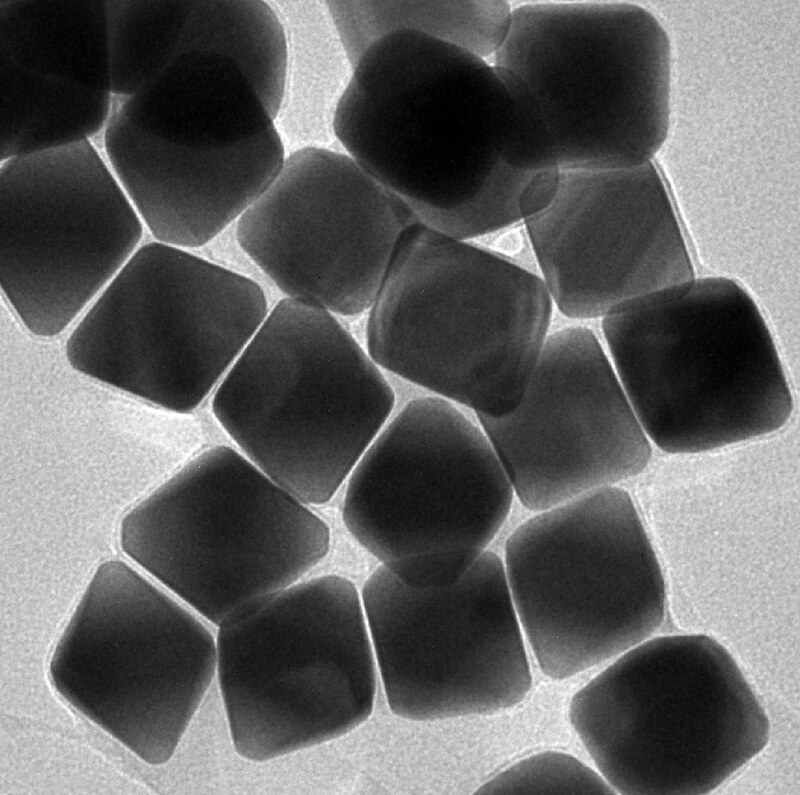 These nanoparticles are commonly used as MRI contrast agents in magnetic resonance imaging (MRI). Furthermore, magnetic nanoparticles can be used in nanotherapy either through magnetic-field-directed drug delivery or through magnetic hyperthermia which involves localized heating of diseased tissues and therefore, cell death. Silica is a highly biocompatible biomaterial which is often used in nanomedicine. Mesoporous silica nanoparticles are silica nanoparticles which have been template-patterned to have pores throughout the particle. This is done through the use of surfactants like Cetrimonium bromide (CTAB), which is extracted after synthesis leaving holes where the CTAB once was. In these pores, water insoluble materials can be added, such as drugs for chemotherapy, dyes for imaging or even small nanoparticles. These pore sizes can be controlled to encapsulate various sizes of biomolecules. Silica is often used to coat nanoparticles to achieve biocompatibility and to simplify further functionalisation. Now, saving the best for last – plasmonic nanoparticles. Plasmonic nanoparticles consist of noble metals like gold, silver, copper and aluminium. At the nanoscale, these materials can support Localized surface plasmons, which is a collective oscillation of the free surface electrons at the interface between the nanomaterial and the surrounding dielectric medium when resonance occurs between the natural resonant frequency of the surface electrons and the frequency of the incident light photons. The LSPR can be tuned with the material, size and shape of the nanoparticle. Plasmonic nanoparticles can scatter and absorb light, for example, for smaller nanoparticles absorption tends to dominate (more light is absorbed – which is generally converted to heat energy) and for larger nanoparticles scattering tends to dominate (which is exploited in bioimaging). For this reason, smaller nanoparticles are often used in photothermal therapy. In Photothermal therapy, plasmonic nanoparticles accumulate in diseased tissues then are irradiated with resonant light, the nanoparticles absorb this light energy and convert it to heat energy, resulting in localised heating of the damaged tissue. This localised heating causes cell death, thus this therapy can be used for cancerous tumors. This heating can be visualised using thermographical measurements or using a dark field microspectroscope, plasmon scattering can be used in medical imaging. Please give Biomedical applications of plasmon resonant metal nanoparticles, Liao et. al. a read for additional information.